Carfax is located at the conjunction of St Aldate's (south), Cornmarket Street (north), Queen Street (west) and the High Street (east) in Oxford, England. It is considered to be the centre of the city. 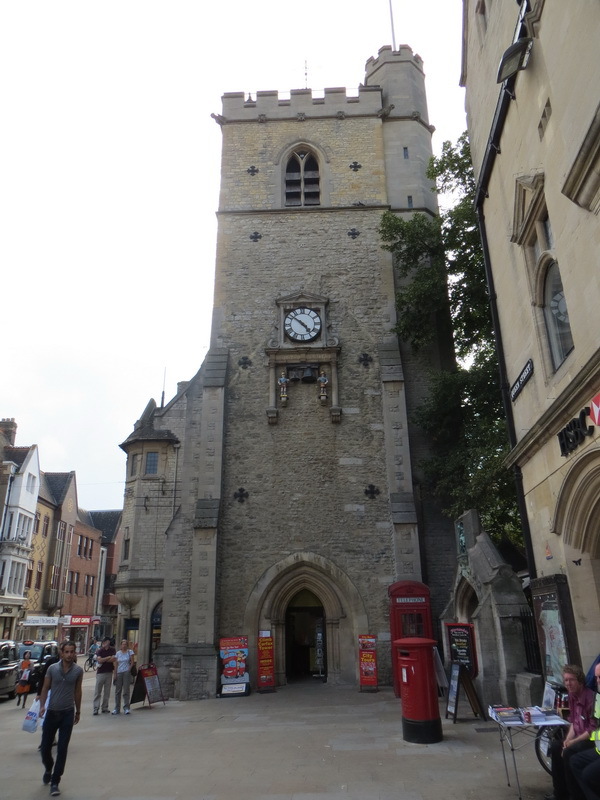 The name "Carfax" derives from the French "carrefour" - "crossroads" or quatre-face "four-face"
The Tower is all that remains of the 13th century St Martin's Church and is now owned by the Oxford City Council. It was the official City Church of Oxford, where the Mayor and Corporation were expected to worship, between 1122 and 1896, when the main part of the church was demolished to make more room for traffic in the area. In 1896, the City Church was moved to All Saints Church in the High Street. The tower is 23 m tall, and no building in central Oxford may be constructed higher than it. It still contains a ring of six bells, recast from the original five by Richard Keene of Woodstock in 1676. These chime the quarter hours and are rung on special occasions by the Oxford Society of Change Ringers. It is possible to climb to the top of the tower for a good view of the Oxford skyline. The tower is open 10 am – 5.30 pm (Easter to October) 10 am – 3.30 pm (October to Easter).